- It stood taller than the Statue of Liberty, was more massive than six Boeing 747 jetliners and generated more thrust than two dozen of the jumbo jets. The tallest, heaviest and most powerful rocket ever successfully flown launched for the first time 50 years ago Thursday (Nov. 9). NASA's Saturn V booster, which carried 24 astronauts to the moon and lofted the United States' first space station into Earth orbit, is now instantly recognizable as an icon of the U.S. space program. 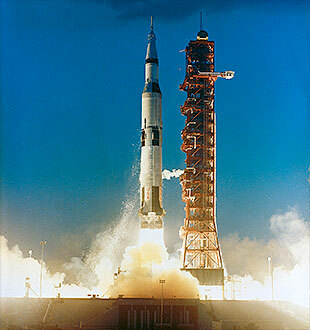 It made its debut in flight on Nov. 9, 1967, launching the Apollo 4 mission on an "all-up" test of the vehicle. 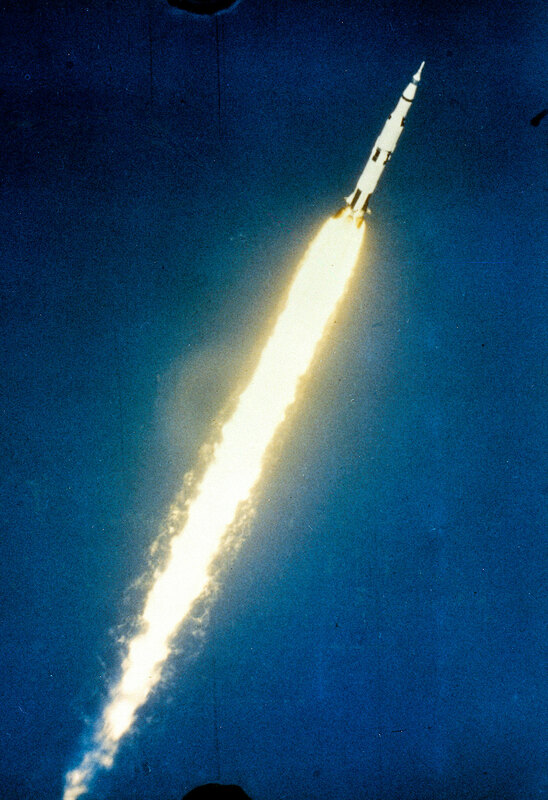 "[If] we shall send to the moon ... a giant rocket ... capable of withstanding heat and stresses several times more than have ever been experienced, [and] fitted together with a precision better than the finest watch — then we must be bold," stated President John F. Kennedy in a 1962 address at Rice University in Houston. Five years later, that bold rocket stood poised to be the first booster to launch from NASA's Pad 39A at Kennedy Space Center in Florida. Designed by a team led by rocket scientist Wernher von Braun, and assembled from more than three million parts furnished by an army of workers at 20,000 companies, universities and government facilities, the 363-foot-tall (110-m) Saturn V was an unprecedented feat of engineering. The towering booster leapt off Earth on its maiden mission at one second past 7:00 a.m. EST (1200 GMT), as its five, first-stage F-1 engines pushed the rocket slowly skyward. "We have lift-off!" announced NASA's launch commentator Jack King. Fifteen seconds later, he noted the vehicle had "cleared the tower." Despite being more than 3 miles (5 kilometers) away, King witnessed firsthand the effect of the launch. "The vibration from the Saturn V showered us with dust and debris from the ceiling of the Launch Control Center, which was brand new at the time," he said. At CBS's mobile studio, where anchor Walter Cronkite was broadcasting the launch on live television, they had to hold a large picture window from being blown in by the Saturn V's shockwave. "It's terrific, the building is shaking!" stated Cronkite. "Look at that rocket go into the clouds at 3,000 feet! Oh the roar is terrific!" 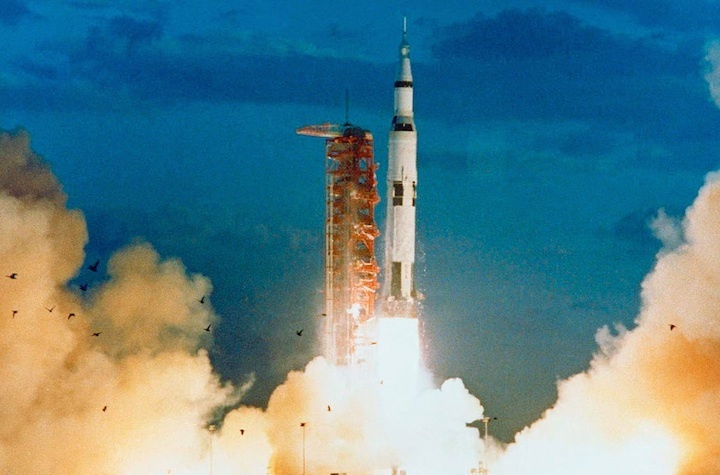 The Saturn V, with what is now its familiar black and white roll pattern, continued to climb until about two minutes and 20 seconds into the flight, when the S-IC first stage cut off its five F-1 engines and, depleted of its fuel, dropped away. The S-II second stage then ignited, continuing to push the vehicle beyond the 50 miles downrange (80 km) that the rocket had already traveled. The launch placed the Saturn V third stage, the S-IVB, and the Apollo 4 command and service module that rode atop it into an almost circular, 100-mile-high (190 km) orbit. The S-IVB stage was later reignited to boost the spacecraft to an apogee of 11,234 miles (18,079 km) above Earth. The 8 hour, 36 minute and 59 second mission ended with the Apollo 4 spacecraft re-entering Earth's atmosphere at almost 25,000 miles per hour (40,1000 k/ph), simulating a return from the moon and splashing down to the northwest of Midway Island in the northern Pacific Ocean. The Apollo 4 capsule was recovered by the carrier USS Bennington. 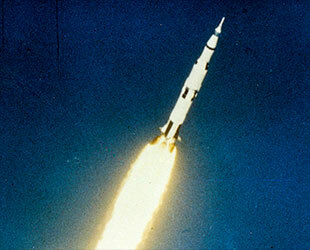 NASA declared the first flight of the Saturn V a resounding success. "It was really an expert launching all the way through from lifting off exactly on time to the performance of every single stage," said von Braun, then director of NASA's Marshall Space Flight Center in Huntsville, Alabama. 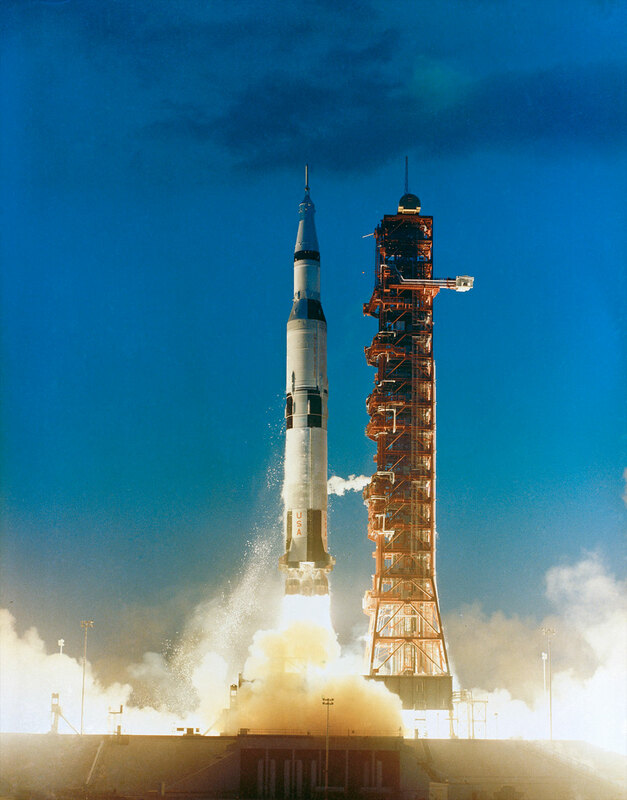 "The maiden [flight] of the Saturn V dramatically increased the confidence of people across the nation," stated George Mueller, NASA's associate administrator for manned space flight at the time. The Apollo 4 mission (also known as AS-501, the Saturn V designation number) was followed by a second and final uncrewed test flight of the mighty rocket, Apollo 6 (AS-502) in April 1968. Despite that mission encountering significant issues, the Apollo 8 crew became the first to launch atop a Saturn V and fly to the moon just eight months later. 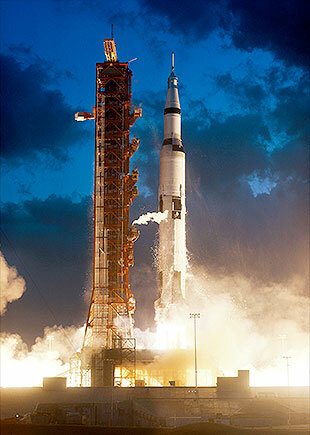 In total, NASA launched 13 Saturn Vs between November 1967 and May 1973. The final flight of the booster lofted a modified S-IVB stage into orbit to become Skylab, the first U.S. space station. Two more Saturn V rockets, and a facilities demonstrator, were built but not flown. Today, they are on public display at NASA's Kennedy Space Center in Florida, the Johnson Space Center in Texas and U.S. Space & Rocket Center in Alabama. The Apollo 4 command module, the only part of that first Saturn V mission to be recovered, is now on exhibit at the Infinity Science Center in Mississippi. NASA is now working toward the first flight of the Space Launch System (SLS), a heavy-lift rocket that in advanced configurations will stand taller and be more powerful that the Saturn V. The maiden SLS flight on NASA's uncrewed Exploration Mission-1 (EM-1) is targeted for late 2019 or early 2020.